How Last Jedi Sets Up Leia's Death in Star Wars 9? The one question on everyone's mind heading into Star Wars 9 is what will happen to Leia. She is the last of the human legacy characters to survive. And she was supposed to be a main character moving forward. But Carrie Fisher's passing in 2016 meant that The Last Jedi would mark her final appearance in the franchise. Disney and Lucasfilm have made it clear that no actress will replace her, nor will the character be resurrected using CGI. Now that Leia has ridden off into the sunset of a brighter tomorrow, with the spark of the Rebellion ignited, how will the next sequel go about introducing her departure? There are new clues in the upcoming book adaptation of The Last Jedi that hint not all is well with General Leia. And one of that film's most controversial scenes will actually be responsible for the funeral scene we're likely to see in the opening moments of the next movie. While it appeared that Leia survived being blown into space, that's not true. Many fans hated what has become known as The Mary Poppins scene. After being blown out the back of her ship, and finding herself floating through space, Leia uses the force for the first time ever on screen to fly through debris and save herself. But not all is right once she is back aboard with the Resistance. As it turns out, Leia has not fully recovered when we see her awaken from her coma in Star Wars 8. The new Last Jedi adaptation reveals something we don't learn in the movie. The general is suffering from solar radiation and hypoxia. And those won't be easy to recover from. When we see Leia on Crait, covering her face in that iconic shot from the trailer, later in the movie itself, she is actually very sick. Even as someone who is one with the Force, it's unlikely that Leia will recover from her space injury, even though she appeared to be doing okay at the end of the last sequel. It's not known if there is any unused footage of Leia that will be utilized in Star Wars 9, but it sounds like director Rian Johnson used everything he had. And of the 14 deleted scenes coming to Blu-ray and DVD next month, none of them are specific to the Leia character. 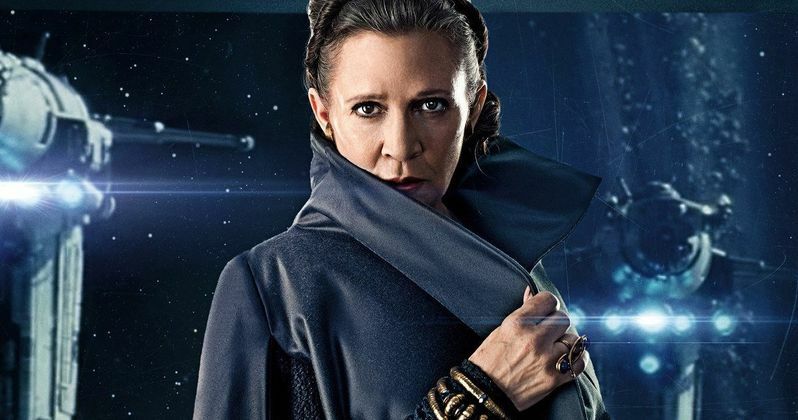 Disney and Lucasfilm have made it clear that Leia will not return in Star Wars 9, so her passing will happen offscreen, and likely be mentioned in the opening crawl. J.J. Abrams recently announced that he'd finished the script for Star Wars 9, which holds the true answer. And it's very likely that Rian Johnson and J.J. Abrams went through and discovered a way to hint at Leia's impending crisis. The upcoming Last Jedi book adaptation contains a number of deleted scenes as well as all new scenes written specifically for the book. One of those scenes is an off-screen funeral for Han. From the sounds of it, Leia will get an on-screen funeral. This latest news comes from an overview of the new Last Jedi book adaptation reported on by Games Radar.